In short, freekeh is wheat, nothing else. That's it. Freekeh, occasionally called farik or even frik (and sometimes misspelled as "freekah" or "frikeh"), is young green wheat that has been toasted and cracked. It's a healthy whole grain food, much like bulgur wheat, wheat berries, and other whole grains. Although freekeh has been around for centuries, its recent resurgence can be traced back to an Oprah Winfrey Show segment in which freekeh was featured in 2010. Freekeh is part of the "ancient grain" food and health trend that also includes quinoa and teff and is very popular amongst vegetarians and vegans. Why Should I Eat Freekeh? Fiber, fiber, fiber! The incredibly high fiber content of freekeh has been credited with weight loss (since fiber fills you up and keeps you feeling full), and, if you're not eating a healthy well-balanced diet already, you could probably use more fiber in your diet. 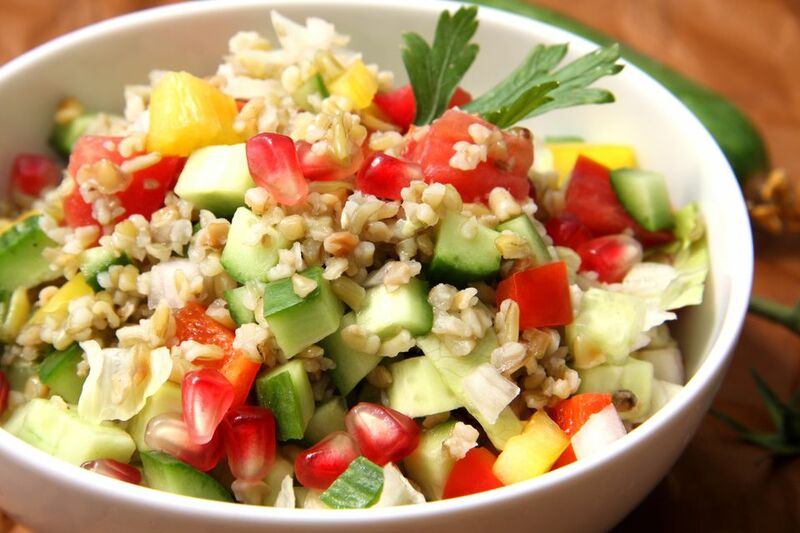 Whole grains such as freekeh are full of essential nutrients such as selenium, potassium, and magnesium. Like quinoa, freekeh makes an excellent source of protein for vegetarians and vegans. Many Whole Foods locations stock cracked freekeh along with the other packaged whole grains, but, unlike other whole grains, freekeh is rarely found in the bulk foods section. Occasionally, you may find freekeh in the ethnic foods aisle, along with other Middle-Eastern foods. Wegman's and many smaller co-ops and organic grocers stock this grain as well. Freekeh importers have store locators on their websites, and of course, it's widely available online. It also comes pre-flavored in tamari or rosemary sage flavor. If you've got a local Middle Eastern grocer, they might also stock an imported brand. Like bulgur wheat, freekeh is a whole grain, but it is usually sold cracked, which increases its usability since the cooking time is reduced but doesn't change its nutritional content. Cracked or not, freekeh is a healthy whole grain. Whole freekeh (uncracked) takes about 45 to 50 minutes to simmer, while the cracked variety takes about 15 to 20 minutes to soften and cook thoroughly. To prepare freekeh, you'll want a little bit more than a two-to-one ratio of liquid to freekeh, so about two and a half cups of water or vegetable broth for every cup of freekeh. Simmer freekeh, covered, for 15 to 20 minutes. When the liquid is absorbed and the grains are soft, they're ready to be used. Like pasta, some people prefer to cook freekeh in salted water with a bit of oil, but this is a personal preference. If you're already used to cooking with whole grains, then you'll have plenty of ideas for using freekeh, from whole grain salads to pilafs, stir-fries, risottos, tabouli, and soups. If you can do it with rice, you can probably do it with freekeh. Freekeh sushi, anyone? Ever Wonder What Broccolini Is? Baking Powder: What It Is & How It Works. What is Caramel and How Is It Made? What Are the Best Ways to Cook Tripe?